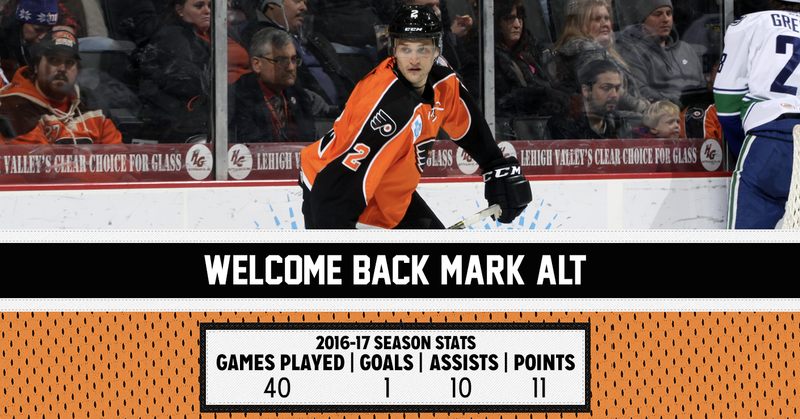 The Philadelphia Flyers, parent club of the Lehigh Valley Phantoms, announced today that they have re-signed defenseman Mark Alt to a one-year contract, according to general manager Ron Hextall. Alt, 25, is coming off his fifth season with Flyers organization. While with the Phantoms, over the course of the 2016-17 season, he tallied 11 points (1G-10A) over 40 games. He also finished the season ranked second among Lehigh Valley defensemen with a plus-minus rating of +8. With four full seasons at the American Hockey League level, Alt has accumulated 68 points (12G-56A) over 237 total contests. The University of Minnesota product made his NHL debut with the Flyers on Mar. 28, 2015 vs. San Jose where he logged 9:25 of ice time. Another thrilling season of Lehigh Valley Phantoms hockey at PPL Center will be here before you know it. Reserve your season tickets for the 2017-2018 season of Phantoms hockey. For more information on how to reserve your seat at PPL Center to the hottest ticket in town, call the Phantoms front office today at 610-224-GOAL !